Lynch begins his first season as a member of the Ducks coaching staff. He is reunited with manager Wally Backman after the two spent seven seasons as teammates with the New York Mets. The pair were both a part of the club’s 1986 World Series Championship, with Lynch then going on to spend parts of two seasons with the Chicago Cubs. The Brooklyn native served as both a starting pitcher and reliever, appearing in 248 career MLB games (119 starts) and compiling a 4.00 ERA, eight complete games, eight saves and 396 strikeouts. He was originally selected by the Texas Rangers in the 22nd round of the 1977 amateur draft. Following his playing career, Lynch went on to attend the University of Miami School of Law, where he graduated in 1991. In 1994, he was hired by the Cubs as the team’s General Manager and served in that role from 1994 until 2000. The 62-year-old has held various other front office positions in professional baseball, including Director of Player Development for the San Diego Padres, Special Assistant to the GM for both the Mets and Cubs. 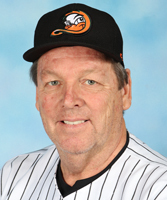 Most recently, he served as a Major League Scout for the Toronto Blue Jays for six seasons (2010-15).